Copyright © 2012 LITUANUS Foundation, Inc.
DANAS LAPKUS is the new art editor of Lituanus. He is an attorney and author in Chicago. 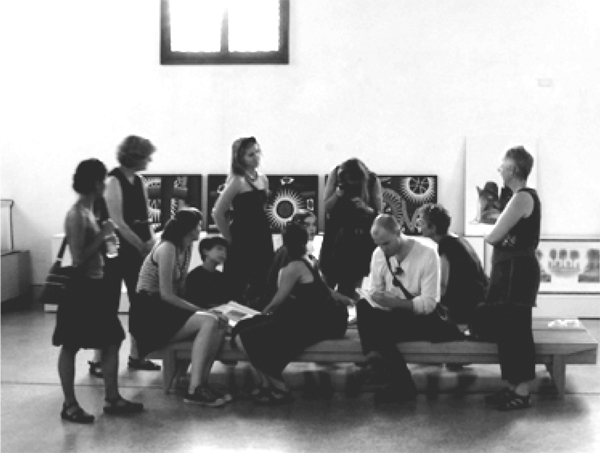 The Lithuanian Pavilion at the 2011 Venice Biennale International Art Exhibition has won the Special Mention award. It’s a particular honor, since La Biennale, held in Venice, Italy every other year since 1895, is considered by many to be the most important and prestigious event of the art world. La Biennale is comprised of numerous national pavilions scattered around the Old Town of Venice. Each pavilion features an exhibit organized by a curator selected by its country. The national pavilions compete for the Lion Awards, which are awarded by international juries. Behind the White Curtain, Curator Darius Mikšys, Commissioner Kęstutis Kuizinas. “It’s an odd moment to come across a project that feels completely new and, at the same time, progressive and likeable,” wrote the art critic Karen Archey upon visiting Behind the White Curtain at the Lithuanian pavilion. 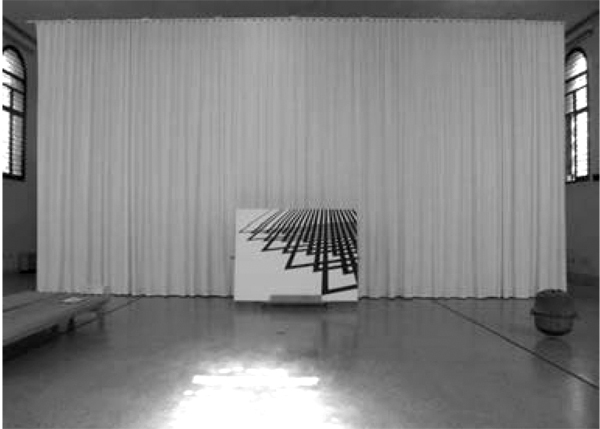 In his initial proposal for Behind the White Curtain, Darius Mikšys stated that he wanted to feature the works of artists who have received a State Grant from the Ministry of Culture of the Republic of Lithuania during the last two decades (1992- 2010). This collection would show Lithuanian art as a phenomenon resulting from the actions of the Lithuanian state and, by extension, Lithuanian society. The collection would allow an outside observer to comprehend the nature and the scale of the phenomenon and would enable its creator – Lithuanian society – to reflect upon itself. Mikšys’s concept has arisen from the interplay of art, politics, and national identity. According to Mikšys, the Lithuanian state intentionally promotes a certain kind of art product by awarding state grants to certain artists. 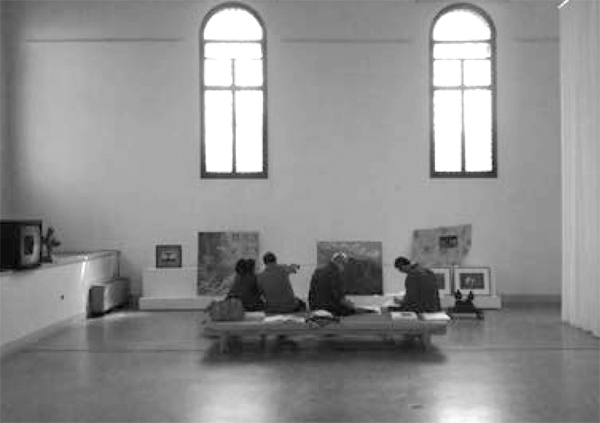 The state assumes the role of the art connoisseur and the curator. By its actions, the state creates an immense art exhibit that lasts for decades. How does one view such an exhibit, or is it even possible? Mikšys got in touch with artists who have received a state grant from Lithuania’s Ministry of Culture over the past two decades, requesting work made during the time the artist received the award’s funding. Mikšys received 173 works, which were documented and made into a catalog. 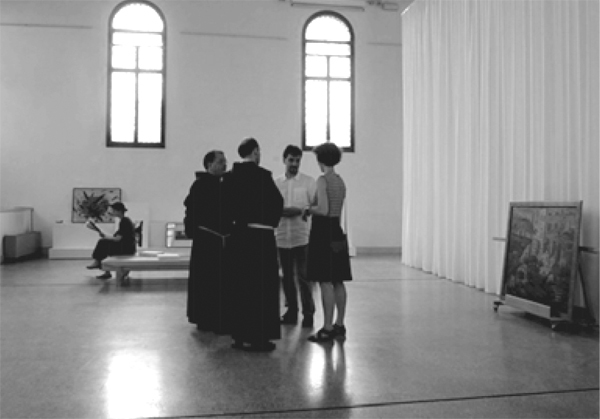 The works were then shipped to a Venetian church rented as the pavilion and archived behind a large white curtain, lending the exhibition its name. 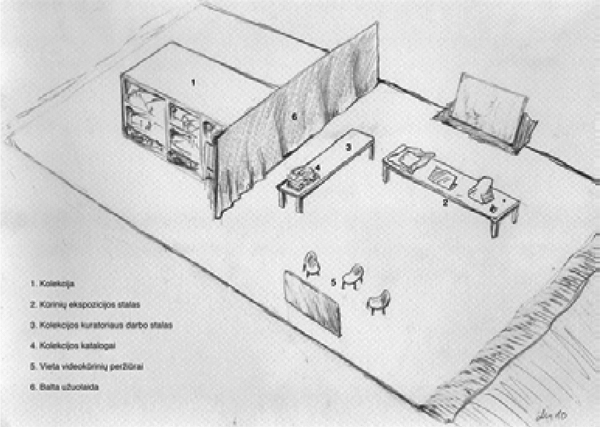 Visitors to the exhibition could browse the catalog and choose works to be retrieved from the archive and displayed in a structure custom-made for the exhibition. On entering, one is subjected to a rather sparse, gallery-like environment, with the majority of works stored behind the eponymous curtain. 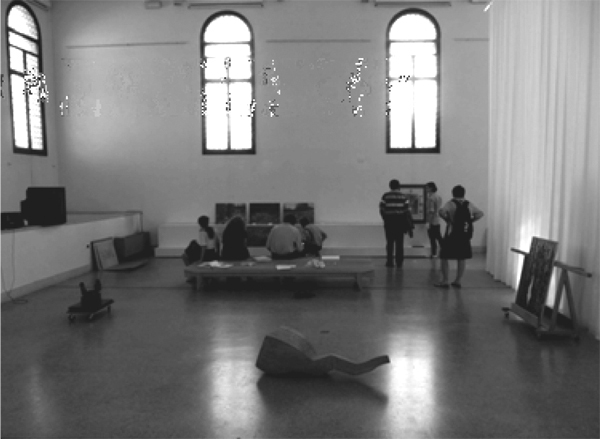 In front of the curtain, a temporary display of works is placed according to the whims of visitors to the space. Catalogues line the edges of the room, and once asked, staff will collect the works for the viewer and place them according to their specific wishes. The spectator then is empowered, resulting in both a very exciting, but also very unusual experience. After lingering for a while it became apparent that visitors interact with the archive in various ways, some organizing their own exhibition of various works, others (like me) finding an anomalous work they’d like to see in real life. To be sure, much of the art in the archive wasn’t exactly of ‘international’ caliber, offering many an aesthetic cliché and non-ironic pastiche. The concept behind the Lithuanian pavilion was, arguably, more important than the works on display. Mikšys’s concept ensured the lucid and approachable presentation of a large and diverse group of artists. 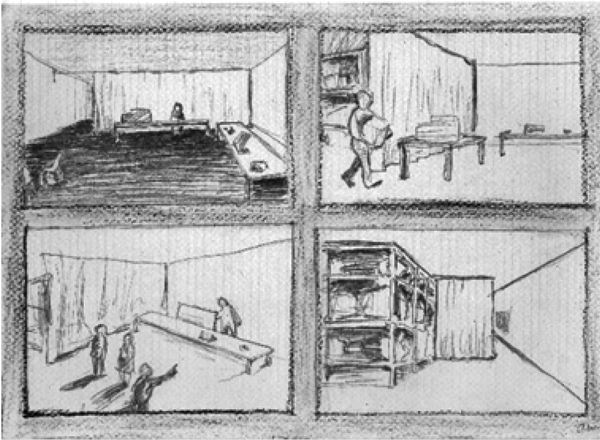 Sketches submitted with the proposal showing the exhibit space. The pavilion functions as a gallery. It consists of two parts – the lobby/office space and the storage space. These are divided by a half-open white curtain, behind which one can see the packed collection of works. The visitor is greeted by the curator of the collection, who introduces the project’s concept and demonstrates the catalogue presenting the works of the State Grant recipients. The visitor chooses from the catalogue the work(s) that he or she would like to see. Then the chosen works are unpacked and brought to the visitor from the storage space. The visitor visually inspects them on the exhibition table standing in the lobby. These works remain on the table for other visitors to see until they are replaced by other works that the visitors express interest in. At this point, the works that were brought out first are packed again and taken back to the storage space behind the white curtain. In this way, each visitor can see a different, custom-made version of the Lithuanian collection. The presented works are registered. This process of the works’ presentation is viewed as a performance. The performing person, or the curator of the exhibition, must be well acquainted with the collection’s content. He is the ‘ideal’ viewer who virtually ‘sees’ the collection as a whole. Photographs and some of the factual material in this article were used by permission of the Contemporary Art Center (CAC) of Vilnius, Lithuania. 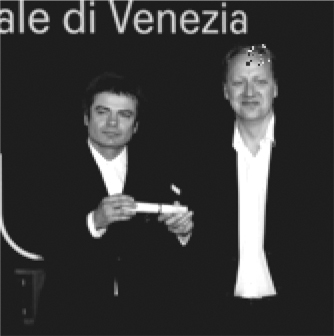 Kęstutis Kuizinas, Director of the CAC, is the Commissioner of the Lithuanian pavilion at the Venice Biennale International Art Exhibition.